I am excited and honoured to welcome back all the continuing students and parents of our Bloomfield Family. The school year 2017-2018 was a year of “Raising the Bar of Excellence”, which was amazingly obtained in all our endeavors, curricular, co-curricular and extra-curricular aspects. This new school year, 2018-2019 will be quite a challenging year as we focus on seeking, discovering, and creating new avenues to effect an academically excellent environment, as we fulfill the Philosophy, Vision, and Mission of the school. As we move forward towards meeting the challenges of making our school the paragon of Center for Science and Technology, we integrate and assimilate with us our new members of the Bloomfield Family who are attending Bloomfield for the first time and welcoming back as well our former Bloomfield parents and students who have returned this school year. We begin this school year filled with great hope for a successful year ahead of us. With quite a large number of new students especially in the seventh grade, this is going to be an interesting year with many personalities added, resulting to a colourful mixture of collaboration among students. That goes true with the parents as well. Injecting new blood enlivens, energizes and invigorates the organization. So let’s make Bloomfield soar high again this year!!! Hereunder are some announcements for the months of June and July. The School Calendar will be posted in our website so you can refer to it for guidance. However, the complete one will be distributed to you through your children on the first week of school. Junior – Senior High School 4:00 p.m. This is a very important meeting that should not be missed as the Department of Education requires all parents of all ESC grantees to attend this Orientation Meeting. Attendance is a MUST! 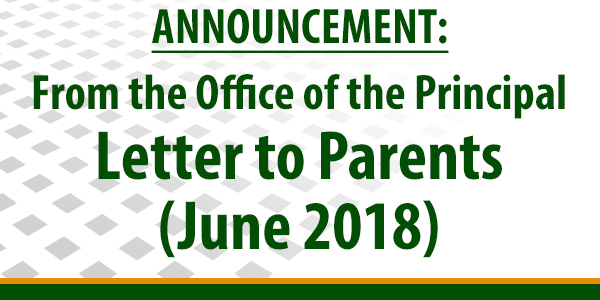 This is to inform you that the attendance will be submitted to the PEAC Office.